Bring back all the magic and romance of that day 50 years ago with this beautiful Pearl Rose 50th Anniversary Serving Set! This two-piece cake knife and server is an elegant new favorite that's perfect for your special day. Each piece is crafted with glazed porcelain handles. Where the blades and handles come together are finely sculpted rose blossoms and leaves. A raised stem wraps around each handle and travels down to a gold-toned "50th" emblem for a lovely finishing touch. Please note: Optional engraving is available with your first names and the date of your wedding or your anniversary. Engraving is available in any of the seven fonts shown below. 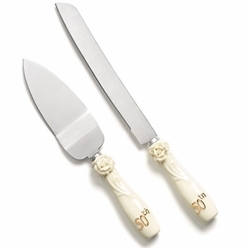 Engraving on both the cake knife and cake server will be identical. Find additional cake-cutting classics! Preview dozens of other styles and more in our collections of wedding cake server sets! Everything you need to bring your special day to life is right here in our full collection of 50th anniversary party supplies!